Back in 2012, Google released some amazing underwater Street View imagery from a few areas around the world. As part of World Oceans Day last Sunday, Google has released some additional underwater Street View imagery that is equally stunning. In partnership with the Catlin Seaview Survey, you can now dive and explore some additional locations in Belize and the Philippines including the Belize Barrier Reef and Tubbataha Reefs Natural Park. This is REALLY neat! 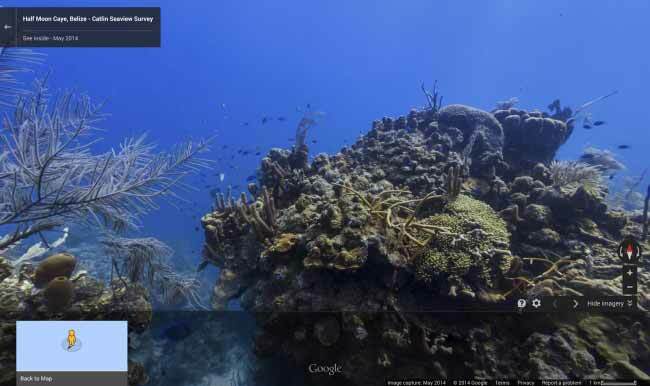 Google Street View has gone underwater at HalfMoon Caye. The Catlin Seaview Survey team has documented many underwater locales around the world using their 360-degree panoramic SVII cameras, including a growing number of UNESCO Marine World Heritage Sites. We’ll continue to add this imagery to Street View in Google Maps as it’s collected. In the spirit of World Oceans Day, the goal of this project is to expose the world to the beauty of these marine habitats, and to create a scientific baseline record so that their changing health can be monitored over time. To learn more about these new additions, check out the full article on the Lat Long Blog or explore Google’s entire collection of underwater Street View imagery at maps.google.com/ocean. You can also check out this article from last year that discusses some of the technical hurdles that they face when working to capture this kind of imagery. Just when we thought it was one video, there's MORE. Click on the "Virtual Dive" tab to "go" Scuba diving at many of #Belize's best dive spots.